They are so young and so brave. Let us hope that this War will end soon. In December of 2005, Professor Bill Estill read an article that identified Vermont as the state with the highest per capita loss of soldiers from the Iraq war. That was when the idea hit him. Estill approached students in his television production classes with the idea to make a documentary that would serve as a memorial to those fallen soldiers. The film would celebrate the lives of these Vermonters, through interviews with the friends and family members they left behind. Medical malpractice insurers recently filed their financial statements for 2006, known as Annual Statements, with state insurance departments. 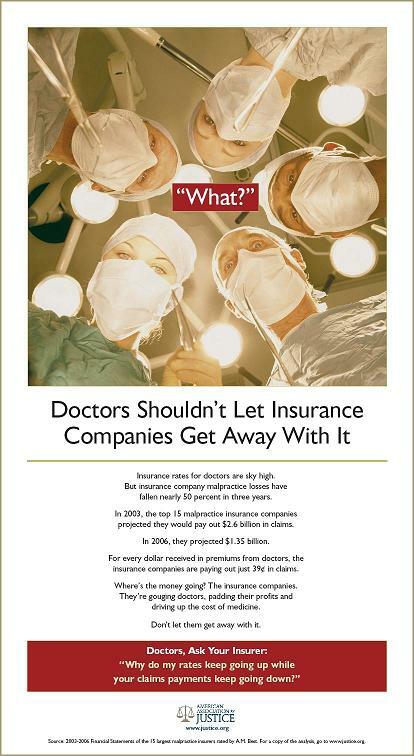 The data contained in these Statements demonstrate that the premise on which the insurance industry based its “tort reform” campaign of the last several years–that malpractice claims payments have been increasing–is false. Specifically, the 2006 Annual Statements reveal that the amount the leading malpractice insurers project they will pay out in claims in the future has declined; that the amount they have actually paid out in claims has declined; and that their surplus–the extra cushion they have accumulated over and above the amount they have set aside to pay claims in the future–has increased to an all time high. In addition, the 2006 Annual Statements reveal that notwithstanding the record surplus and profits of these carriers, they have generally declined to issue any dividends to their policyholders. “Are you kidding me?” says Senator Trent Lott, a Mississippi Republican, when asked why he’s so critical of insurance companies.Lott, 65, launches into a critique of the industry, peppering it with words such as “arrogant” and “mean- spirited,” statistics about company profits and executive pay and angry questions about why its lobbyists are fighting a clutch of bills he is pushing — including one that would strip companies such as State Farm Mutual Automobile Insurance Co. and Allstate Corp. of their 62-year-old exemption from federal antitrust laws. The Senate’s No. 2 Republican has become the industry’s No. 1 critic in Congress ever since he lost a house to Hurricane Katrina in 2005. While Lott recently settled with his insurer, State Farm, after a year-long court battle, he is continuing the fight in the Senate. His experience, the senator says, has convinced him that an industry he defended his entire career is in need of reform. An analysis linking the widely used diabetes drug Avandia to higher risk of heart attacks represents a serious blow to GlaxoSmithKline PLC and underscores how outside critics have been empowered to challenge big-selling drugs after the outcry over the withdrawn painkiller Vioxx. Glaxo rang up more than $3 billion in world-wide sales of Avandia last year. Its share price fell more than 7% after the New England Journal of Medicine released the analysis by prominent cardiologist Steven Nissen of the Cleveland Clinic, who helped raise early safety concerns about Vioxx. The analysis suggested that people on Avandia have a 43% higher chance of suffering a heart attack. One issue coming under congressional scrutiny is whether the Food and Drug Administration should have acted faster to alert the public about possible risk from Avandia. Glaxo performed its own meta-analysis, which also showed a potential danger. It shared an early version of it with the FDA in September 2005 and a more complete one in August 2006. The findings weren’t reflected on the U.S. label, which is supposed to give a comprehensive review of the drug’s risks. This data is arguably misleading because to the varying thresholds to get to a jury trial in a particular jurisdiction. If a jurisdiction allows, or even requires, jury trials for cases where the plaintiff’s lawyer is seeking, for example, over $10,000, the awards are going to be a lot lower. In Maryland, for example, where the average verdict in personal injuries cases is around $12,000, many small claim type personal injury cases find their way to Maryland juries. This is because defense lawyers in personal injury cases in Maryland have the ability to remove a case to the Circuit Court from the District Court (if the plaintiff seeks more than $10,000 but less than $25,000). Defense lawyers often do primarily to increase the burden on Maryland personal injury lawyers in jurisdictions where juries are less favorable (counties other than Baltimore and Prince George’s). Still, I think the data is interesting because it gives personal injury attorneys some idea of the jurisdictional differences.